When a sunny day at the beach turns stormy, a little girl runs for cover. Her daddy and brothers are wild in the wind and lightning, and her poppy is as loud as thunder. They fill the house with stamping and crashing while Granny plays piano to their riotous thunderstorm dancing. until the storm passes and they all fall down. Then, in the stillness, the girl is ready to play. What will she be, now that the rain has stopped and there's a glimmer of sunlight? Katrina Germein is an early childhood teacher who writes stories about the places she goes and the people she meets along the way. Her first picture book, Big Rain Coming (illustrated by Bronwyn Bancroft), has remained in print since publication in 1999. My Dad Thinks He's Funny (illustrated by Tom Jellett) was Highly Commended in the Prime Minister's Literary Awards. Judy Watson is an illustrator and designer. She has illustrated a number of children's books, including the Extraordinary Ernie and Marvellous Maud series by Frances Watts and Goodnight Mice! which won the Prime Minister's Literary Award for Children's Fiction in 2012. 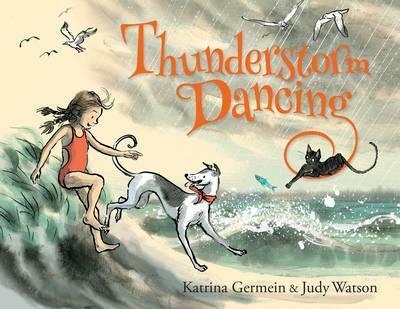 Judy's artwork for Thunderstorm Dancing was Highly Commended in the Illustrators Australia Awards 2015.